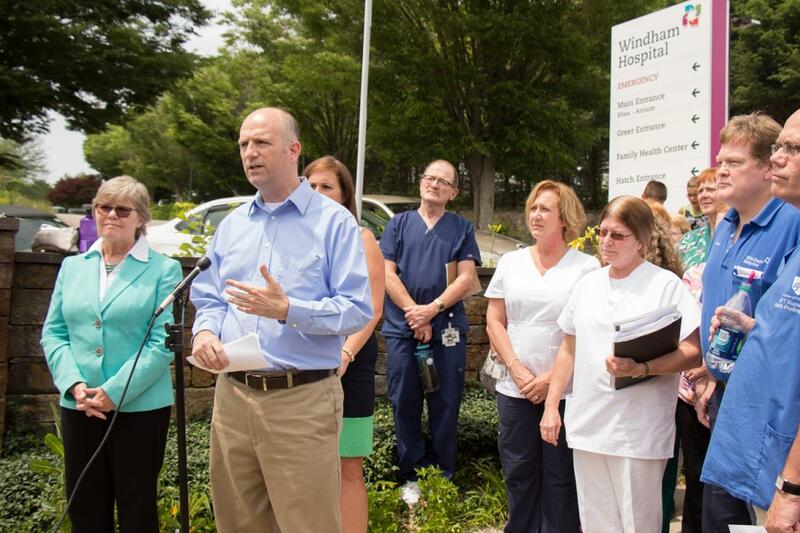 Late last week, Sen. Mae Flexer, Rep. Susan Johnson and I held a press conference outside Windham Hospital alongside current and former hospital employees protesting Hartford Healthcare’s proposed service and position cuts at our own Windham Hospital. Hartford Healthcare, Windham Hospital’s parent company and registered non-profit, plans to close a number of programs and services, including CCU, the critical care unit! A physician who worked at Windham for 30 years wrote to tell me that closing the CCU would have a devastating impact on the hospital. He even went so far as to say that doctors may not continue to refer patients to Windham Hospital if it doesn't have a CCU! And, in the end, over 100 people will lose their jobs at WCMH. These are our friends and neighbors. This announcement was made despite the news that Windham Hospital will receive an additional $2.8 million in state aid under the recently passed biennial state budget. Considering Windham Hospital’s increase in state aid, I find it difficult to fathom why the proposed cuts are necessary. To be fair to Hartford Healthcare, I'll share that it justifies its decision by claiming that Windham Hospital loses close to $11,000 a day. But we must put that in perspective. The salaries of just the top three Hartford Healthcare executives combined is over $11,500 a day. What's more, any losses at Windham are likely a self-inflicted wound. I've heard from constituents who tell me that under Hartford Healthcare's management, patients have been transferred from Windham to Hartford Hospital for many procedures leading to an ever lower patient count here. When you work for a non-profit, you make a commitment to value people over profits. Why then, is the CEO of Hartford Healthcare being compensated with a $2.1 million salary? And why was he awarded an $498,000 bonus when Windham Hospital is suffering, not thriving, under his management? It is time that CEO’s and top executives stop asking employees and families to make all the sacrifices. It is time that they too share in the sacrifice. My relationship with Windham Hospital started 49 years ago. It is where I was born and it is where I take my daughter when she wakes up sick in the middle of the night. Windham Hospital is a vital member of our community and I will not allow it to collapse without a fight.